BMG is once again on course to turn over in excess of $500m in a calendar year, after posting its half-year 2018 results today (August 30). 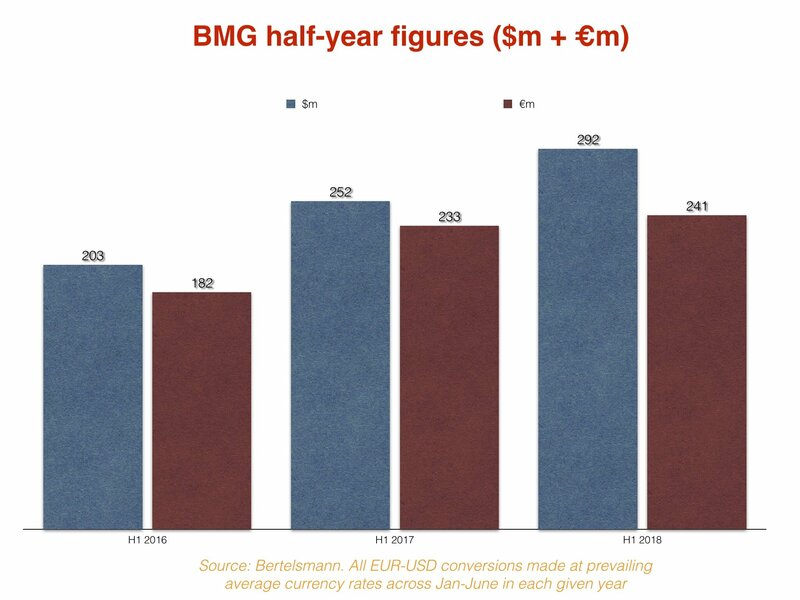 Hampered by unfavourable currency exchange rates, Bertelsmann-owned BMG’s total turnover across publishing and records was up 3.3% in H1 2018, to €241m ($292m). According to an internal note sent to staff by BMG CEO Hartwig Masuch today, that number was in fact up 9.2% when currency effects are removed – growth which Masuch said was “nearly twice the expected rate of growth of the market as a whole”. A glance over at Universal Music Group’s results in the same period is a good reference point to contextualize these figures. Vivendi-owned UMG, which also reports in Euros and suffered similar currency effects, saw its face-value revenue (across publishing and records) actually fall year-on-year in H1 2018, by €38m, down 1.4% to €2.628bn. At constant currency, however, UMG’s figures were healthier, up 6.8%. BMG posted an EBITDA profit margin of €42m ($51m) in the first half of this year, up 5% on H1 2017 – and representing a 17.4% margin. Perhaps the most impressive figure in BMG’s H1 2018 results is this one: recordings revenue grew 38% on a like-for-like basis when compared with the same period of 2017. In his memo, Masuch noted that recordings now account for more than a third of BMG’s total revenues, a new high – meaning that the firm’s masters operation brought in somewhere around $100m in the first six months of this year. “We achieved this increase almost entirely through organic growth,” he said. “Our spending on acquisitions in the first half was at its lowest since we started our initial build phase of BMG nearly 10 years ago. Added Masuch “I mention the switch to organic growth and the particular success of our recordings business because they illustrate a significant truth about BMG: we do what we say we will do. Just over a year ago, I said we would prioritise these two things and 12 months later we have delivered to plan. “Doing what you say you will do has often been a rare commodity in the music business. At BMG we like to do things differently: say what you mean, mean what you say – and then get it done. Key recorded music releases coming from BMG before the end of the year include albums from Alice In Chains, Lenny Kravitz, The Prodigy, Richard Ashcroft and Avril Lavigne.